In 1939, T.J. Getzen took the bold step of starting the Getzen Company in a converted barn behind the family home in Elkhorn, Wisconsin. That year, a rich family tradition in the musical instrument business was born. A tradition that continues on to this day, nearly 75 years later. 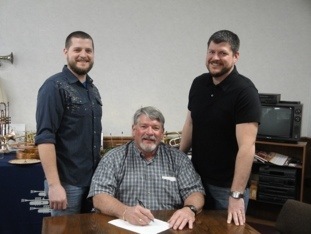 Following that heritage, Brett and Adam Getzen, the great-grandsons of the company’s founder, are proud to announce that, effective February 13, 2013, they have purchased the Getzen Company from their father Tom Getzen. The sale marks the fourth generation of the Getzen family at the helm of the company. A rarity in the instrument business these days. Brett and Adam both have several years of experience with the company. Each has worked extensively in the factory since a young age and has been involved in nearly every aspect of instrument manufacturing. Today, Brett’s focus is on sales and marketing while Adam is currently managing production. Both are also heavily involved in research and development as well as quality control. Tom Getzen will remain an important part of the company as he takes his new position as Chairman of the Board. Brett Getzen will become President with Adam serving as Vice President.